​Before we delve into the curious case of the Four Flowers Variant (or Varient), let’s first establish exactly what it is, and how it differs from Dugan’s Four Flowers and the seldom-seen Scandinavian version of this pattern. All three are shown below. The Four Flowers Variant pattern is the same in broad concept as Dugan's Four Flowers, but it has the addition of a long stemmed bud between the four sets of claws in the design. On the back, it may have a thumbprint pattern or it may be plain and there is a many rayed star in the very centre of the base. Four Flowers Variant was made using a one piece mould, and therefore they have no mould seams. It has a ground base, often with a number of tiny chips, and frequently the glass is full of air bubbles or even streaks of pigment. The edge is scalloped. 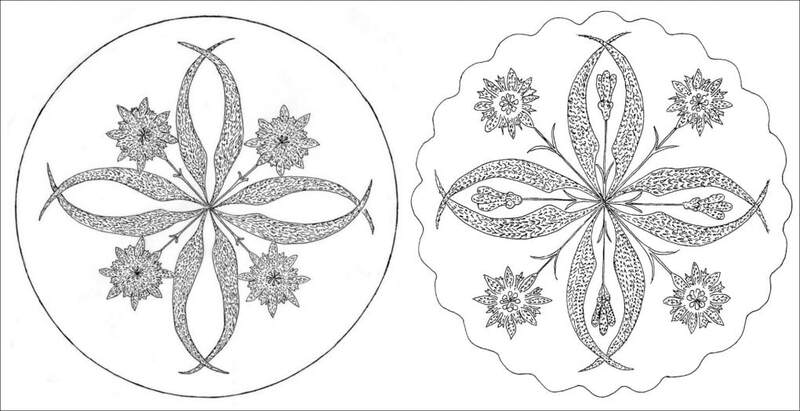 The most frequently found shapes in the Four Flowers Variant design are the 8" to 9" inch bowls and plates. There are scarce examples that are both bigger and smaller. 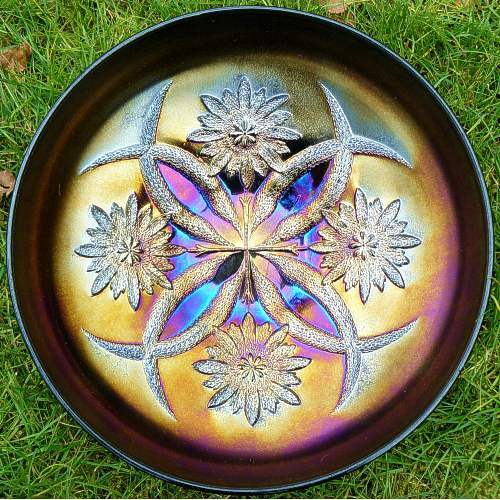 Large 10" bowls and 11" chop plates (one is shown later) can be found in green and purple, and very impressive they are too! The Variant is found in an astonishing variety of green base glass, ranging from icy green, delicate teals and aquas, through to apple green, emerald and dark olive. There’s amber, deep and strong as well as delicate and light, fresh pale yellow, and purple of every shade; some so dark it's almost black, through to lighter shades of amethyst. And there’s an odd shade, a strange, almost murky, semi-opalescent light green. Our recent, intensive research leads us to believe that the maker of the Four Flowers Variant was Brockwitz in Germany, probably from as early as 1905 or 1906. This is ground-breaking and challenging information, and the reader can see our detailed analysis and evidence in this extensive, fully researched article: Untangling The Gordian Knot. Examples of the wide range of unusual colours of Four Flowers Variant are shown below - amber, purple and green. Above left: Four Flowers, and on the right, Four Flowers Variant. The Four Flowers pattern was made by Dugan in around 1911 for only about a year or so, and is known mainly in marigold, peach opal and purple. 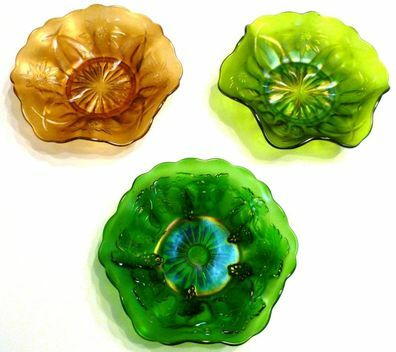 Dugan’s Four Flowers is known in both large and small, plates and bowls. It may have a plain back, a basketweave design or the exterior pattern "Dugan's Soda Gold". It appears that the pattern wasn't used by Dugan after 1912 and Carl Burns speculates that the moulds might have been lost in Dugan's 1912 fire. 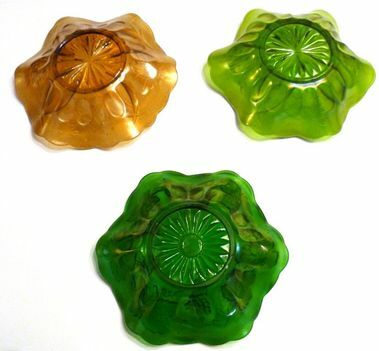 While many other old Dugan moulds have turned up (and been used by firms such as L. G. Wright and Fenton), Dugan's Four Flowers moulds have never been found and identified as such. There is also a Scandinavian version of the Four Flowers pattern. It was made by both Eda Glasbruk in Sweden and by Riihimäki in Finland, predominantly in the bowl form but also in a very scarce plate shape. The colours are marigold, blue and rare shades of pale lilac and green. The Scandinavian version of the Four Flowers pattern looks exactly like the Dugan version (so it does not have the long stemmed bud between the four sets of claws. It could possibly have been made using the Dugan mould, but this is not proven. The Scandinavian Four Flowers version has a ground base. The Dugan version does not. In fact it now looks like Four Flowers design, without the intervening long stemmed buds! See examples on the right - two sizes and two colours! It was in the late 1990s, that UK collector, Maureen Davies reported a 7.5" teal green bowl in an unusual variation of the Four Flowers. 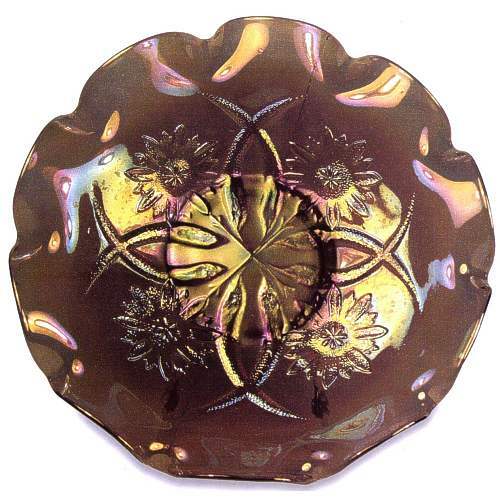 Then, in 2001 (in our “Century of Carnival Glass”) we illustrated an example of this intriguing twist on the Four Flowers Variant—another 7.5" teal bowl that we dubbed the Hybrid. Until recently, just a few examples of this 7.5" bowl were known, and then came the shock! John and Frances Hodgson report not one, but two Hybrid bowls in a smaller 6.5" size—one is green, one is amber. ​The truly fascinating aspect of all these Hybrid bowls is the pattern variation—there are no intervening long stemmed buds that distinguish the Four Flowers Variant from the Dugan Four Flowers. Everything else, however, is characteristic of the Four Flowers Variant. The Hybrid has the Thumbprint exterior, a scalloped edge, a ground base and is made from a one-piece mould. On the examples we have studied, the glass itself is full of streaks and bubbles, just like the Four Flowers variant pieces. Above you can see two group shots (interior and exterior) of the 6.5" Four Flowers Hybrids—amber and green: courtesy John & Frances Hodgson. Also (in the foreground) is a green Mystery Grape 6.5" bowl—the “sister” pattern of the Four Flowers Variant and surely from the same maker. The angle of the shot makes the Hybrids look smaller, but they are actually the exact same size as the Mystery Grape. Our intensive research has now revealed the fascinating and truly intriguing background to the Four Flowers Variant and the Hybrid. Our belief is that the maker of these patterns was Brockwitz in Germany, and possibly from as early as 1905. Read the full story in this fully researched, comprehensive two part article: Untangling The Gordian Knot. Read all about the Mystery Grape in this article.